As operators prepare to provide premium UHD channels to their customers, the ability to repurpose existing HD content for distribution over those channels will be vital. 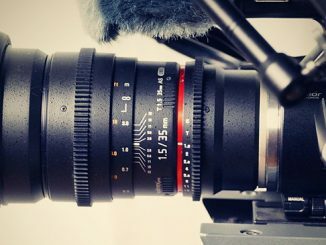 Repurposing this media for distribution to different platforms or destinations typically requires high-quality standards conversion to different frame rates and resolutions. For example, for distribution partners like iTunes and Netflix, it’s necessary to recreate the original 24 fps (frames per second) video from a 29.97 fps asset. As a result of the partnership between Telestream and Cinnafilm, users of the Telestream Vantage Transcode and Vantage Transcode Pro media processing platforms, running on a Lightspeed server, can meet these challenges by licensing Cinnafilm’s Tachyon standards conversion engine. This option makes it possible to access Tachyon seamlessly as part of the Vantage workflow. This high-end standards conversion is extremely challenging because of the high likelihood of encountering technical issues that can lead to costly rejections from distribution partners. These issues include: broken 3:2 pull-down cadence, intermixed field dominance, intermixed video mode, and composited cadence errors. 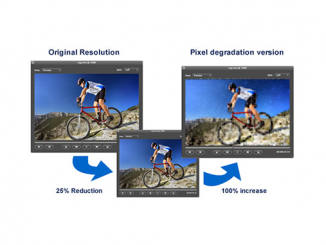 With such features as advanced pull-down removal, motion compensated frame rate conversion and image scaling, Tachyon is capable of handling complex standards conversion tasks to ensure the creation of high-value media assets for distribution. If Vantage Transcode and Vantage Transcode Pro users need noise reduction and texture-aware-scaling, they can also license Vantage Transcode’s Dark Energy option. Cinnafilm’s Dark Energy works with Vantage’s video codecs—among other tools—to provide an automated solution encompassing a wide range of technical operations. Dark Energy’s capabilities include: HD(2K) to UHD(4K) upscaling, UHD(4K) to HD(2K) downsampling, denoise and degrain without image degradation, and accurate image texture to ensure that images look authentic at all resolutions. With Dark Energy’s upscaling capabilities, it’s possible to create UHD assets that are virtually indistinguishable from content shot using a UHD camera. And its texture management tools allow users to scale video while maintaining authentic looking texture. Using noise reduction prior to encoding can increase compression efficiency, resulting in higher quality video at lower bit rates. Being able to encode video at lower bit rates, without quality loss, can result in cost savings in many distribution scenarios, such as when distributing content via a CDN. It also benefits cable or satellite operators, among others trying to get maximum throughput from their distribution channels. Both Dark Energy and Tachyon have frame mechanics capabilities to normalize mixed mode video and to repair broken pulldown/telecine cadence. But, since the Dark Energy option doesn’t support frame rate conversions as part of its workflow, users will also need to have Tachyon in their workflow as well. 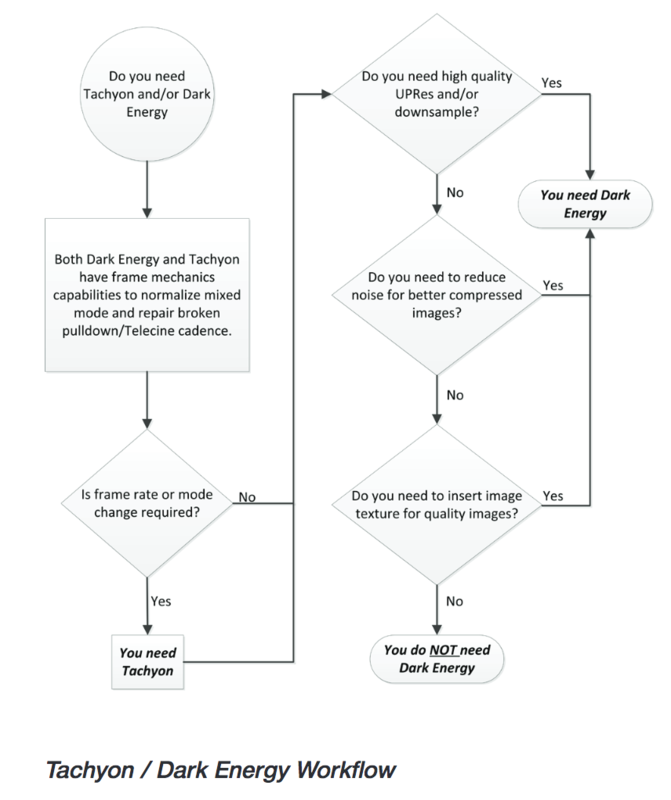 And Tachyon users that need to reduce noise for higher quality compressed images should opt for Dark Energy as part of their workflow. The combined Tachyon/Dark Energy workflow is advantageous to those customers that need maximum flexibility for standards conversion, scaling and noise, and texture management. It also benefits service providers that want to offer a wide range of solutions to their customers, especially if their needs will change on a project-by-project basis. 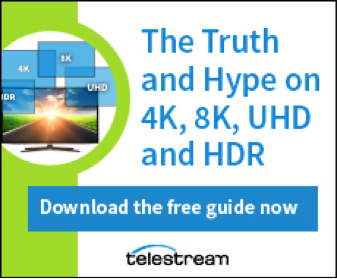 To learn more visit our website or email us at sales@telestream.net, or for more information about 4K, 8K, HDR and UHD, download our guide here. Learn more about Telestream products by visiting our website at www.telestream.net or phone 1-530-470-1300. You can also Download the Cinnafilm Solution Brief and Tachyon VPL Application Note here. And for more on Cinnafilm products, visit http://cinnafilm.com/or phone 1-505-242-6626.